A 56 days-feeding trial was carried out to investigate the effects of Water Lettuce Leaf Meal as a partial replacement for Yellow Maize Meal in the practical diets for the freshwater mud catfish (Clarias gariepinus) juveniles. Five diets in which WLLM replaced YMM at 0%, 25%, 50%,75% and 100%; designated as Diet 1(control), Diet 2, Diet 3, Diet 4 and Diet 5 respectively. The replacement levels were prepared and fed to Clarias gariepinus juveniles. 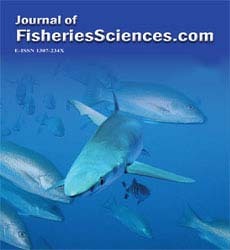 At the end of the feeding experiment, the replacement effects on the growth and nutrient utilization indices; weight gain(WG), specific growth rate (SGR), protein efficiency ratio (PER), Food conversion ratio (FCR), percentage survival rate (PSR) and total fish production (TFP)were determined. The treatment fed with control diet 1 WLLM (0%) gave growth and nutrient utilization results as expected. Weight gain (70.60 g) in WLLM (Diet 1) was significantly higher (p<0.05) than 38.32 g for WLLM (Diet 5), but not significantly higher than 69.70g for WLLM (50%). Also, SGR 3.10 g/day (diet 3) was significantly higher than other diets except control diet 1(0%) WLLM. Likewise, FCR observed in the group fed control diet 1(2.45) was not significantly better than diet 2 (2.69) and diet 3 (2.53). Empirically, There was no significant difference (p>0.05) between the feed efficiency of practical diets 1, 2 and 3; PSR in the group fed 50% WLLM (86.67) was significantly different than values observed in groups fed other diets. Hence, made diet 3 (50% WLLM) having incredible total fish production value of 7.49 kg/m3.